Ginger is my everyday friend, ans is one of the basic item that you can't miss in your kitchen. Nearly every food recipe needs ginger. Nutritional Effects of ginger: the main ingredients of pungent taste in ginger include zingerone, ginger alcohol and ginger hydroxybenzene which are volatile to some extend. Therefore, eating garlic can strengthen and accelerate blood circulation, stimulate the secretion of gastric juices, assist digestion and protect stomach. Ginger also can stimulate secretion of sweat, warm innards and stop vomit. To drink some ginger soup when catching cold can play a very good role of treatment. I tried Ginger Soup for Fighting Flu and it really works. 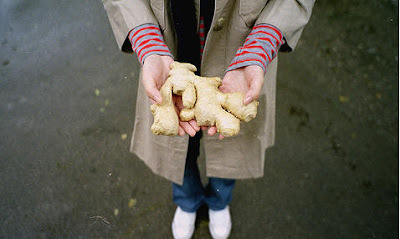 In traditional Chinese medical sense, eat more ginger can do more helpful benifits to your health.Using GingerFor a cup of fresh ginger tea, one should steep about five or six thin slices of ginger root. A teaspoonful of the dried root may be used in a pint of hot water. Cover and let steep for 30 minutes. Herbalists have recommended hot dried ginger root tea, in wineglassful doses every couple of hours, to help allay symptoms at the onset of a cold, relieve mild nausea or mild diarrhea. Ginger tincture (in which the root is soaked in a menstruum of alcohol and water), sometimes labeled as "drops" or "extracts," are available in health and natural food stores. Herbalists recommend ten to twenty drops of ginger tincture in a little water with meals to counteract indigestion or help fight early symptoms of cold or flu. Some people, however, may not be able to tolerate the burning sensation caused in the stomach. Capsulated dried ginger root products, and capsulated products with standardized amounts of gingerol are also widely available. Read the product label for dosage and use information.